Born-again Larry left his electronics company to join the staff of a nonprofit ministry, Campus Crusade for Christ, as a financial counselor. In 1976 Larry left Campus Crusade to form Christian Financial Concepts (CFC), a nonprofit organization dedicated to teaching the biblical principles of handling money. In September 2000, CFC merged with Crown Ministries, creating a new organization, Crown Financial Ministries. Burkett served as Chairman of the Board of Directors until his death. 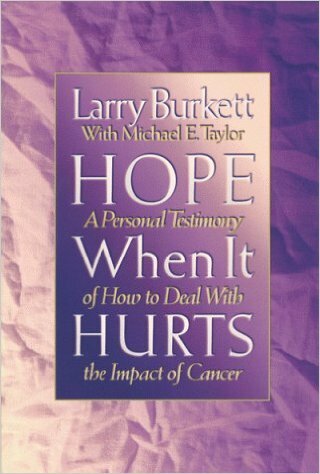 Burkett died of heart failure after a long battle with cancer and other health problems. His book, Hope When It Hurts, contains many advices to fellow Christians who are facing life-threatening illnesses such as cancer. After all, the author himself had surgery to remove his cancerous kidney and shoulder blade. After reading though this wonderful book, I was much taken aback by his sound, down to earth advice. I have learned and was blessed by his advice and outlook about what it means having to go through life with cancer. To my Christian friends, I say — Read this book! Here are some quotations from Larry’s book. In the years since I was diagnosed with cancer, I can honestly say that God has been good to me. He hasn’t chosen to rescue me from this difficulty but rather, has sustained me through it. I have never asked God WHY this happened. It really doesn’t matter why. Instead, I have asked WHAT God would have me to do as a result of having cancer. We’re all going to die some day; that is NOT a choice. We can choose to live in fear or anger or pity or in the peace of God. that’s OUR choice. I choose to live in God’s peace, enjoying each and every day as best I can. I sincerely pray that all of God’s people will choose to do the same. Happiness REALLY is a choice. Courage is not the absence of fear. Courage is the ability to look fear in the face and proceed with your life. When emotional storms raged in my heart, I prayed to Him with words similar to the disciples, “Lord, don’t you care what’s happening?” He did and He blessed me with His peace. My testimony to you is that God is in control. He is holy. He is righteous. He is completely sovereign. He never makes a mistake and He is completely worthy of your trust. Most of all I asked the Lord for peace, His peace. I have experienced a lot of trauma in my life, and I know what it’s like to live with God’s peace and without it. To receive a blessing from the Lord in your time of need, I point you to John 14:27, John 16:33 and Philippians 4:4-7. Often God uses natural things to rescue His people. They are not always those instantaneous, miraculous answers that we see sprinkled through God’s word. We helped one another to be strong. When one of us got down, the others comfort, console, encourage and pray…That’s why God put other people in the world to be able to help you when you aren’t functioning at 100 percent. What will happen to the ministry if I die? So what does happen to a major Christian ministry when the leader becomes gravely ill …or dies? That was on my mind, as well as the minds of many of our supporters. The ministry of Christian Financial Concepts is not my invention or my creation. Instead, this ministry exists because of a calling from God … As is the norm in our society, people give praise and accolades to teachers and writers, but I have tried over the years not to let that go to my head because … we’re stand-ins for what the Lord wants to accomplish. Note: Many people (and I too) have asked a similar question, What is going to happen to CA Care when Chris Teo is gone! Yes, the answer is with Go. We are just His stewards. My wife and I are just as happy to close CA Care ANYTIME if this is His will — Let your will be done, Lord. I cannot overstate how much it meant to know that God’s people were praying for me. I could literally feel their prayers. I could sense God’s hand upon me. Though God didn’t remove the tumours supernaturally, He certainly did provide what He promised to me, and that was His peace. I believe it came as a direct result of God’s people caring and praying. When ask how could (others) pray for me, I replied with four items: that God would grant my doctors mercy and grace in the upcoming surgery; that the cancer would not return; that God would sustain us in His supernatural peace; and that He would use the circumstances to draw us closer to Him. I personally believe there are at least four reasons why people become ill.
First, we live in aging bodies in a fallen world, which results in sickness and suffering. If I drive my car long enough, I know the parts must eventually be replaced and the same is true with our bodies. Second, some people get sick because of sinful behaviour which is, in fact, harmful to their bodies. Third, God allows an illness to come upon people for the benefit of the kingdom of God. Obviously God didn’t cause (the) injury, but He allowed. Fourth, God sometimes allows Satan to buffet Christians to determine the caliber of their faith. The clearest example of that in Scripture is Job. The idea that no Christian should ever be sick or experience any kind of problem …. except as the result of unconfessed sin, is not biblical and it comes very close to heresy. Certainly God “allowed” .. . cancer because He knows about everything that happens to each of us. Probably none of us will know WHY these things happen. But I don’t believe that God goes around zapping His people with disease as a reminder of their previous sin. Be careful when you box God into one, and only one, way of responding. He is sovereign, meaning He is completely free to rule and act as He chooses. He is not a magical genie to be called out of an old lamp to rescue us upon demand. We also can be presumptuous with God when we conclude that only good things happen to His people. I disagree with the basic premise that bad things never happen to good people. If you are building your Christian foundations on the idea that your commitment to God will automatically insulate you from suffering here on earth, you’re in for a big shock. …Even if you have cancer or some other terminal illness, live in such a way that others can detect the hope that is within you, and then be prepared to tell the reasons behind your hope… Don’t be phoney about it; just ask God to grant you joy and peace in your affliction. Let God’s grace and strength transform what looks like a problem for you into an opportunity to witness to other people. It’s true that we can be discouraged, but we’re never in despair … Our Lord promised: I will not leave you as orphans; I will come to you. John 14:18. God is faithful. He is a forgiving God. God is merciful. He cares about the pain and suffering you are experiencing, whether it’s physical, mental, emotional or spiritual. Trust Him and He will give you peace. Few things in life are as upsetting as having a loved one facing a serious or life-threatening illness and not knowing what the outcome will be. We prayed steadily that God would give us His peace in the midst of the turmoil. There are times when we worried and were upset. And we prayed for God’s peace on my occasions, particularly when we were afraid or things seemed to be spinning out of control. And the results seemed to be the same each time: We felt like God was literally holding us in the palm of His hand. So if you’re in turmoil right now … let me encourage you to diligently seek God’s peace. Pray specifically for it, and ask others to pray for you. Knowing .. that God is no respecter of persons (Romans 2:11) we did not assume that Larry has “special status” with the Lord. Sometimes God heals people outright; at other times, though faithful, godly saints succumb to serious illnesses. God, show us the way. …Our prayers was for God to supply wisdom and guidance to us… we faced many decisions without the luxury of time to think them over. We needed wisdom to clearly discern what God was responsible for and what we were to take responsibility over. Clearly discerning the things God was responsible for helped us to identify the things we need to relinquish to Him: the first was Larry’s life. Neither I, the doctors, nor anyone else could keep Larry here on earth one second longer than God desired. That’s one major issue I had to give back to the Lord. Doing so also relieve a great deal of pressure, because that meant God, and no one else, was responsible for keeping Larry alive. God, give us strength. Coping with a medical crisis is exhausting. Sleep patterns are interrupted. Comfortable daily routines get cast aside. Watching a loved one hurt is hard work too. … we assumed the posture of faith — trusting God to meet our needs and to supply what we could not supply ourselves. And true to His Word, God raised us up and enabled us to endure days that we never thought we’d see the end of. God, you will be done. Our deepest desire was that God would be glorified through the circumstances we faced. I know that’s easier said than done. I conclude with this thought: God made you. He knows what you can and cannot handle. He promises never to give you a burden you cannot bear without a way of escape. When you find yourself overwhelmed and exhausted by the stress of it all, you may well be taking on more than God want you to assure. Remember, you’re just a part of God’s plan. a cure, but there is no cure! Let us learn to be grateful for what we are each day. Cancer — What to do next? I have just finished reading this great book written by my favourite author – a wise and great man. He is a Jewish rabbi. Then, I found an article in my mail box. Testimony from Singaporean, Dr Richard Teo, Plastic Surgeon, 40 years old … I almost deleted it thinking it was yet another “junk” mail. But his name attracted my attention. After all I am also a Teo – perhaps, people might think he is my brother! So let me reproduce this email and share with you the story of my “brother” (no blood relationship though). Dr Richard Teo Keng Siang, was 40-year-old millionaire and cosmetic surgeon. He was diagnosed with stage 4 lung cancer. This is the transcript of his talk at the Dental Christian Fellowship on 24 Nov 2011. HIS BACKGROUND: Hi good morning to all of you. My voice is a bit hoarse from the chemotherapy, so please bear with me. I thought I’ll just introduce myself. My name is Richard. I’m a friend of Danny, who invited me here. I’d just begin to say that I’m a typical product of today’s society. Before this, I was talking about how the media influences us, etc. So I’m a typical product of what the media portrays. From young, I’ve always been under the influence and impression that to be happy, is to be successful. And to be successful, is to be wealthy. So I led my life according to this motto. I went to church for a while, after some time, I got tired. I said it’s time to go to NUS, stop going to church. I had a lot more things to pursue in NUS – girls, studies, sports, etc. After all, I had achieved all these things without God today, so who needs God? I myself can achieve anything I want. In my arrogance, I told them, “You know what? You go tell your pastor to change your sermon to 2 p.m. I will consider coming to church.” Such arrogance! And I said 1 statement in addition to that – till to date, I don’t know if I’ve regretted saying that – I told Danny and my friends, “If God really wanted me to come back to church, He will give me a sign.”. Lo and behold, 3 weeks later, I was back at church. I couldn’t accept it. I have a hundred relatives on both sides, my mom and my dad. A hundred of them. And not a single one has cancer. To me, in my mind, I have good genes, I’m not supposed to be having this! Some of my relatives are heavy chain smokers. Why am I having lung cancer? I was in denial. ENCOUNTER WITH GOD: So the next day, I was still in a state of denial, still unable to accept what was going on. There I was lying in an operating theatre in a hospital, for a needle biopsy (for histology). There I was, just completed the biopsy, and lying in the operating theatre. The nurses and doctors had left; they told me I had to wait for 15 minutes to do a chest X-ray to make sure there’s no pneumothorax (a complication). I said, “Woah, why did that come from?” You know, when you speak to yourself, you’d say, “OK, what time should I leave this place? Where shall I have dinner after this?” You’d speak from a first person point of view. You don’t say, “Where should YOU go after this?” Whereas the voice that came spoke as a third party. It said, “This has to happen to YOU, at YOUR prime, because this is the only way YOU can understand.” At that time, my emotions just overflowed and I broke down and cried, alone there. And I knew then, subsequently, what it means – to understand why this is the only way. In fact, if I were diagnosed with stage 1 or 2, I would have been looking around busily for the best cardiothoracic surgeon, remove a section of the lobe (do a lobectomy), do preventive chemotherapy. The chances of it being cured is extremely high. Who needs God? But I had stage 4B. No man can help, only God can. A series of events happened after that. I wasn’t sold after that inner voice. No I wasn’t. To me, it was just ‘maybe there was a voice; or maybe that was just me talking to myself.’ I didn’t buy the story. What happened next was that I was being prepared for chemotherapy. I started off with a whole brain radiation therapy first; takes about 2 -3 weeks. In the meantime they prepared me for chemotherapy, supplements, etc. One of the things they used for chemo was a thing Zometa. Zometa. They use it to strengthen the bones; once the bone marrow is cured of cancer cells, it becomes hollow, so we need Zometa to strengthen the bone to prevent compression fractures. I said, “What’s there to lose? Ok lah, pray lah!” And so we prayed. And we did an X-ray after that. Everything was all there, all the appliances and everything. And lo and behold, the X-ray showed that there was no wisdom teeth in the lower jaw. I know most people have 4 wisdom teeth, maybe some have none, but to be missing one or 2, as I understand – I’m not too sure, as I understand – is not that common. I couldn’t grasp that. It was difficult to come to terms. And even as I went through radiotherapy, I was struggling every day, especially when I wake up, hoping that it’s just a nightmare; when I wake up, it’s all over. And it was only days, or was it weeks after, that Danny revealed to me that he had fasted for 2 days for me and he ended his fast at that exact same point, about 2 p.m. thereabouts, that this surge of sensation came to me for no rhyme or reason. And I didn’t know that he was fasting for me. And when he ended the fast, I felt that sensation! Lung cancer has the highest mortality rate. Breast, colorectal (colon) cancer, and prostate cancer (the top few cancers in Singapore for men and women) – if you add up the mortality rate of these 3, it still doesn’t add up to lung cancer. Simply because, you understand, you can remove the prostate, the colon, the breast, but you cannot remove your lungs. But there’s about 10% of lung cancer patients who do pretty well for some reasons, because they have this specific mutation; we call it the EGFR mutation. But still, my oncologist was still not hopeful for me to have this mutation. The chances of it happening for me were maybe 3-4% for me to get it. That’s why I was being primed to go for chemo. But through all the intense prayers, friends like Danny, people that I don’t even know, it turned out that, during my waiting for chemo, the results came back that I was EGFR positive. I was like, “Woah, good news!” Cos now I don’t have to undergo chemo at that time, because there’s this oral tablet that you can use to control this disease. AFTER AND BEFORE: Just to share with you some idea – this is a CT scan – thorax – of my lungs, before treatment. But because of this mutation, they have this oral medication. I didn’t think too much of it. I just continued sleeping. Then I woke up, and I said, “What’s there to lose? I’d just check it out lah!” Danny had bought me a Bible; it’s still quite new. I said, “It’s ok, just try.” So I flipped to the Old Testament. Hebrews to me sounds like something ancient, so it should be in the Old Testament right? So I flipped through the Old Testament. No Hebrews there. I was disappointed. I said, “WAH!! Where did that come from?” I was getting goose pimples all over my body. I said, “This can’t be, right?” I mean, what’s the chance of somebody, who has never read the Bible, to have a vision of a specific verse that answers my question directly? At this point, the chance of that happening is even lesser than my EGFR being positive. There’s just no way; there’s so many thousands of verses in the Bible, how can I just conjure up something like that? Hardship can happen to rich people; it can be physical hardship, mental hardship, social, etc. And also over the last few months, I started to understand what this true joy is about. In the past, I substituted true joy with the pursuing of wealth. I thought true joy is about pursuing wealth. Why? Cos let me put it to you this way, in my death bed, I found no joy whatsoever in whatever objects I had – my Ferrari, thinking of the land I was going to buy to build my bungalow, etc, having a successful business. It brought me ZERO comfort, ZERO joy, nothing at all. True joy comes from interaction with other people. And at a lot of times, it is a short term pride, the past. When you pursue your wealth, Chinese New Year is the best time to do it. Drive my Ferrari, showing off to my relatives, showing off to my friends, do my rounds, and then you thought that was true joy? And your relatives, wow, they share this joy with you? In truth, what you have done is just to illicit envy, jealousy, and even hatred. They are not sharing the joy with you, and what I have is that short-term pride that wow, I have something you don’t have! And I thought that was joy! And most importantly, I think true joy comes from knowing God. Not knowing about God – I mean, you can read the Bible and know about God – but knowing God personally; having a relationship with God. I think that’s the most important. That’s what I’ve learnt. 2. To love and serve others, not just ourselves. There is nothing wrong with being rich or wealthy. I think it’s absolutely alright, cos God has blessed us. So many people are blessed with good wealth, but the trouble is I think a lot of us can’t handle it. The more we have, the more we want. I’ve gone through it, the deeper the hole we dig, the more we get sucked into it, so much so that we worship wealth and lose focus. Instead of worshipping God, we worship wealth. It’s just a human instinct. It’s just so difficult to get out of it. We are all professionals, and when we go into private practise, we start to build up our wealth – inevitably. So my thought were, when you start to build up wealth and when the opportunity comes, do remember that all these things don’t belong to us. We don’t really own it nor have rights to this wealth. It’s actually God’s gift to us. Remember that it’s more important to further His Kingdom rather than to further ourselves. This book is not about how to be happy or how to be popular. There are a lot of other books to do that. It is about how to be successful, but not in the way most people use the word… It is about how to know that you have lived as a human being was meant to live, that you have not wasted you life. It is a book about giving your life meaning, feeling that you have used your time on earth well and not wasted it, and that the world will be different for your having passed through it. Even the rich and powerful find themselves yearning for something more. We keep thinking that if we had what they have, we would be happy…. For all the outward trappings of success, they feel hollow inside. They can never rest and enjoy their accomplishments. They need one new success after another. Our souls are not hungry for fame, comfort, wealth, or power. Those rewards create almost as many problems as they solve. Our souls are hungry for meaning. What frustrates us and robs our lives of joy is this absence of meaning. Our lives go on day after day. But do they mean anything? Is there anything more to life than just being alive…What does life mean? Does our being alive matter? We will find ourselves sick, lonely and afraid if we cannot answer them. What we miss in our lives, no matter how much we have, is that sense of meaning. We may have all the things on our wish list and still feel empty. We may have reached the top of our professions and still feel that something is missing. The need for meaning is not a biological need like the need for food and air. Neither is it a psychological need, like the need for acceptance and self-esteem. It is a religious need, an ultimate thirst of our soul. The question of whether life has meaning, or whether our individual lives make any real difference, is a religious question not because it is about matters of belief or attendance at worship services but because it is about ultimate values and ultimate concerns. The pursuit of happiness is the wrong goal. You don’t become happy by pursuing happiness. You become happy by living a life that means something. The happiest people you know are probably not the richest or most famous, probably not the ones who work hardest at being happy by reading the articles or buying books and latching on to the latest fads. I suspect that the happiest people you know are the ones who work at being kind, helpful, and reliable – and happiness sneaks into their lives while they are busy doing those things. You don’t become happy by pursuing happiness. It is always a by-product, never a primary goal. Happiness is a butterfly – the more you chase it, the more it flies away from you and hides. But stop chasing it, put away you net and busy yourself with other more productive things than the pursuit of personal happiness, and it will sneak up on you from behind and perch on your shoulder. And worst of all, society applauds this imbalance, honouring us for our financial success, praising us for our self-sacrifice. In the Bible, the sin of idolatry is not just a matter of bowing down to statues. Idol worship is treating the work of your own hands as if it were divine, worshipping yourself as the highest source of value and creativity … believing that you have enough power to control the world in which you live and the other people who live in it. Hell is having worked so hard for success that it corroded your relationship with other people so that you learned to see them only in terms of what they could do for you … hell is the loneliness of having everything and knowing that it is still not enough. When you have learned how to live, life itself is the reward. It is a sign of maturity when we stop asking, What does life have in store for me? And start asking, What am I doing with my life? How do you overcome the fear of dying? he asked me. I told him that I was not ready to die, that I hope to live for many more years, but that I was not afraid of dying because I felt satisfied with what I had done with my life. I had the sense that I had not wasted it, that I had lived with integrity, had done my best, and had an impact on people which would outlast me. It is only when you are no longer afraid to die that you can say that you are truly alive. The final ingredient which enables us to say, “I have lived and my life mattered,” is the knowledge that we have made a difference. Nobody on his deathbed ever said, I wish I had spent more time on my business. Who needs God? Can we deal with the issue of life’s ultimate meaning without reference to God? The existence of God in not the issue; the difference God can make in our lives is. In the same way that the human body is fashioned so that certain foods and certain kinds of activity are healthier for us than others, I believe that God made the human soul in such a way that certain kinds of behaviour are healthier for us than others. Jealousy, selfishness and mistrust poison the soul; honesty, generosity, and cheerfulness restore it. We literally feel better after we have gone out of our way to be helpful to someone. God is the answer not because He will intervene to reward the righteous and punish the wicked but because He has made the human soul in such a way that only a life of goodness and honesty leaves us feeling spiritually healthy and human. Over the years – 16 plus years, I have all kind of people coming to CA Care for help. Some were wealthy and famous. Some had impressive tittles in front and behind their names. But some were plain simple folks with no viable income at all. Some were nice and gentle while others were outright abusive and rude. Some cherished the idea that they did not have to pay anything talking to me, while others were happy that they had to pay very, very much less for their medicines than if they were to see their oncologist. In short, I have seen them all – human beings in all their forms, attitudes and human values. But what made my heart bleed is to see those “high and mighty” coming to us with terminal cancer – their medical reports and scans showed that they may not make it through three to six months – yet they have not learned or realized that living life is more than just money. These people (not that they don’t have money) would call wanting to return the herbs (how much was that worth? RM 200 or RM 400?and you do that with your doctors do you?) that they bought after they did not get the results they expected, even if they had already lived six months or more! But fortunately we have learnt early that CA Care is just a door mat. Some come to us expecting to extract the maximum they can squeeze from us! Some came in a BMW or Mercedes and still asked for special discount! We know that is the way life is! 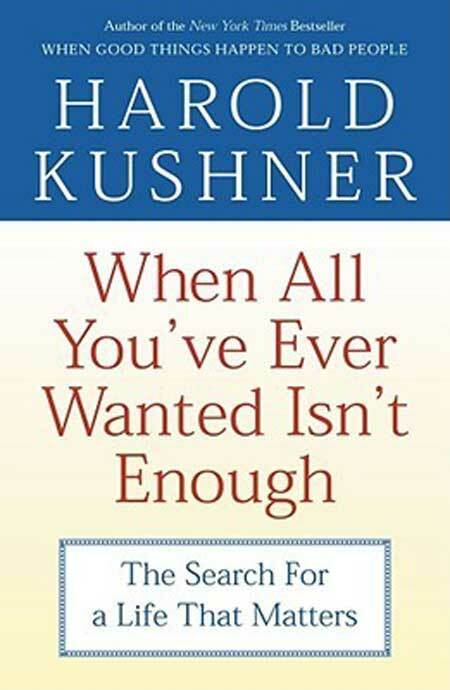 May many of us learn and benefit from the story above and the wisdom of Rabbi Kushner.